Bed Bugs are the perfect parasites; the bane of humankind since our beginning. They are excellent hitch-hikers that find their way into our dwellings in our belongings or the belongings of others who visit. They know how to find us. They know how to feed on us in the dark, undetected as we sleep. And they are masters at hiding from our sight during the day. These behaviors are just some of the factors that make them hard to control. Add to these the fact that they can actually shift their DNA to adapt their nervous systems to slough off pest control materials and you have a recipe for misery. If uncontrolled, Bed Bugs will rapidly multiply from just one impregnated female to hundreds of individuals, in just a few weeks! And moving to a different room won’t help. They’ll simply follow you there and continue multiplying and feeding…on you. Pest Control Center, Inc. is here to help. Our system of inspection and treatment, coupled with preparations our customers make, guided by information that we provide, addresses the infestation aggressively. Our long list of satisfied customers is testament to the effectiveness of our Bed Bug control program. 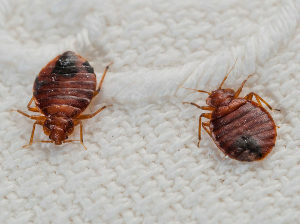 Protect yourself, your family and your property by contacting us today to schedule an appointment for bed bug removal.